A student works on his skateboard deck in a recent class. 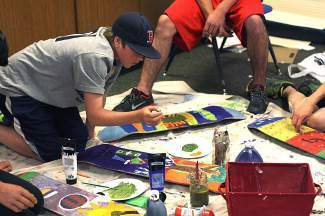 TAHOE-TRUCKEE, Calif. — It’s a school day afternoon and a group of middle school boys is gathered around a drop cloth, painting skateboard decks. Not only is this a positive and creative artistic outlet for boys, but it is also a forum for discussions that explore real life topics such as integrity, dealing with success versus failure, respect, and growing to be your own man. Each topic focuses on leadership through creativity. This is an exceptional school program called Positively Rolling. The elective class, taken in five-week sessions, begins each day with the group gathering in a circle to examine a specific topic. The open format for discussions is geared so all students have a chance to share their experiences and discuss the subject freely and without intimidation. Following the dialogue, the group talks about different symbols and ways the theme can be expressed visually. Then comes the painting. Each student receives a blank skateboard deck to design. The mural style artwork is supposed to be their personal artistic reflection of the day’s discussion topic. And remarkable creations are born. The program was coined “Positively” because it aims to be a positive mentoring force for the boys to become positive people, and “Rolling” because the skateboards are a youthful symbol of rolling forward positively through life. This one-of-a-kind program was created in response to a series of student suicides in the Truckee area and the subsequent need for ways to support self-esteem and coping skills in teenage boys specifically. It began as a pilot program through Sierra Expeditionary Learning School and has since become a nonprofit organization operating under the umbrella of SELS. This has allowed the expansion to Alder Creek Middle School and Forest Charter School this year. Next year the hope is to expand to North Tahoe School. 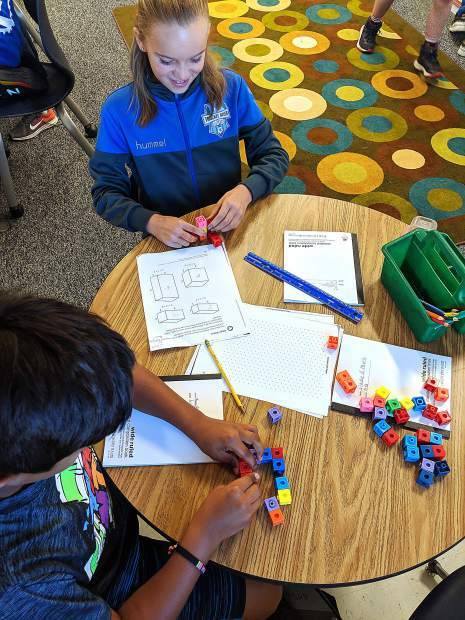 “The ultimate goal is to offer access to this program to every seventh- and eighth-grade boy in the Tahoe Truckee Unified School District,” said Program Director Vicki Isacowitz. Future plans include deepening the program with additional topics and the introduction of digital media projects that can be displayed throughout the community. Due to funding challenges, organizers submitted a grant to the Excellence in Education Foundation and other local organizations. The group subsequently received a generous private donation to pay for the instructors and some materials. The Excellence in Education Foundation contributed $2,650 to help cover costs of skateboard decks, moveable mural artwork, cameras, art supplies and other needs. Positively Rolling exists primarily through donations from the community, and to maintain the program, monetary donations and contributions of used but still rideable skateboards are sought. In Truckee, donation bins are located at Clever Minds (10090 Church St.), Alder Creek Middle School, and Forest Charter School in the Pioneer Center. Donations are tax-deductible. “If we can positively influence even one student and help him make confident decisions in a difficult situation, and he chooses not to take desperate action, then we can call this program a great success,” explained Isacowitz. To learn more, email Isacowitz at vicki@cleverminds.org, visit positivelyrolling.org, or follow the program on Facebook. To learn more about Excellence in Education Foundation’s grant giving program and fundraising efforts, visit ExinEd.org.